Is it Spring/Printemps that's brings out the ladybugs/coccinelles in Paris? Yesterday I saw 3! At the bd Raspail bio marche. On wine bottles no less. Guarding chocolates at patisserie Pause Detente 98 ave. Ladru-Rolin. Ladybugs were out en masse on Saturday. Especially at il etait un fois toy shop - this hugable doudou. An adorable Nathalie Lete designed bebe looks like a ladybug-to-be. Mary janes a ladybug would love to wear at il etait un fois..
As well as a polka-dot picnic basket. Over at La Vaissellerie must-have mugs for any ladybug of note. Plus little teabag dishes - these ladybugs have names! I didn't know there was a whole series of Ladybug girl books! A whole flock of them by Jacky David and David Soman. But I'm wearing Sonia Rykiel stick pins everyday on my raincoat. You never know. That's a lot of good luck! Your work brings me such joy. Thank you! So thanks to your powers of observation, we make the connection...How fashionable lady bugs are - red and polka dots...no wonder they're everywhere in Paris! So cute! I love the polka dot mary janes. I wonder if people would notice if I wore them while playing the harp? Ladybugs certainly pop out this time of year--we see them all over our place in spring. I love all the dotty elements here. Wonderful! I am carrying a tiny glass ladybug everywhere I go. they are always in lettuce during spring/ summer time too! I think it's too early to see one here, but I like the ones you found. I especially like the one that is guarding that very delicious looking mountain of chocolate! I'm sure there will be more to come in Paris!!! The best ones of all are your stick pins! How about polka-dot shoes for grown-ups?? Lady bugs make me think of the movie..Under the Tuscan Sun. :) You do notice everything. Even the ladybugs. Each day, your Paris Breakfast email makes it tolerable to be in Houston, Texas instead of in France where I long to be. Thank you for allowing me to travel vicariously with you! Today's Ladybug issue was delightful. Imagine my surprise when I saw your Ladybug teabag rests with MY name. Any chance you can tell me where you found them and that they have a store online from which I could order one for myself? 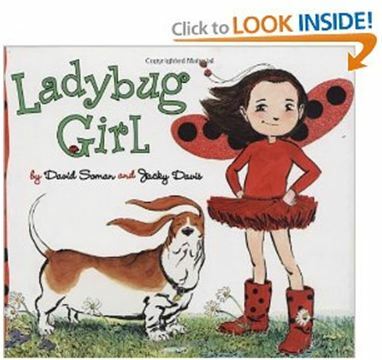 I adore the Basset hound on the front of the Ladybug Girl book. So you know Monsieur Pamplemousse? This is one of my favorite collection! Ladybug is pretty amazing! I'm dotty about them. True, they're everywhere just now but hadn't noticed them in the shops. You have such an eye, Carol! Never seen so many this year. Yesterday had 3 of them fly on to me in the garden. Weird. Ladybug, eh? We call them ladybirds. Don't know which is cuter! 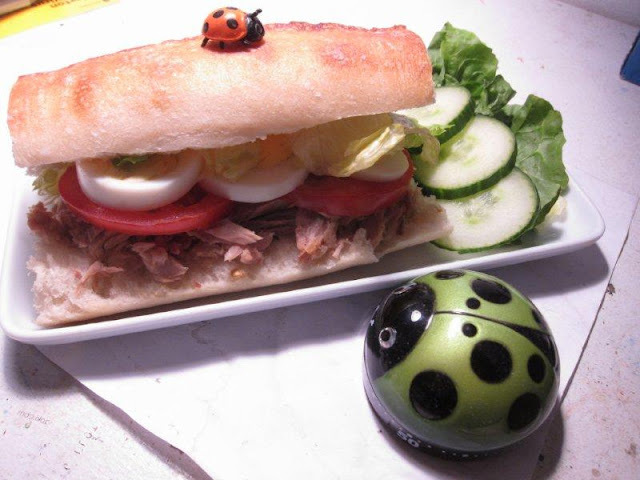 Thanks for the charming idea of ladybugs, coccinelles pictures ! Would it be possible to put them on our Facebook page with credit to you and link to your blog of course ? It was a pleasure to have you in the store for "the grand tour".